Even taxi-drivers sometimes look at you oddly when you say "New Cross Gate". "Do you mean 'New Cross'? ", they say. No, we don't. Telegraph Hill lies partly in SE4 (Brockley - once Brocca's Wood) and mainly in SE14 (New Cross to the postman) but almost every resident, if asked, would say that it's part of "New Cross Gate". So why "New Cross Gate" and why the confusion with "New Cross"? Originally the settlement to the north of Telegraph Hill, where the roads from Vauxhall and Bermondsey meet, was called "Hatcham". New Cross was a separate community, 15 minutes walk down the road, where the Sevenoaks road branched off from the Dover road and mail coaches took their varied ways. The New Cross name comes from the sucessor to the Golden Cross Inn which faced Clifton Rise, the new Cross Inn. We don't know exactly when the name changed, but it was before 1675 as John Evelyn mentions it in his diary for that year. In late 17th century upkeep for main roads passed from the local parishes to statutory bodies, the "Turnpike Trusts" who were empowered to erect gates ("turnpikes") across the road and charge fees for passage. The monies so collected were used for the maintenance of the roads. The New Cross Turnpike Trust was formed in 1718 with a toll gate adjacent to the New Cross House Inn at Clifton Rise, New Cross, and is mentioned by Daniel Defoe in his diary of 1724. 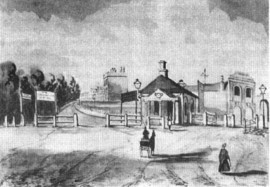 In 1819 the toll gate was moved to the junction of what is now the Queen's Road and New Cross Road in Hatcham following the opening of the Camberwell New Road from Vauxhall. It would have been at this point that travellers might well have started to refer to Hatcham as "the New Cross gate" although the village, rapidly becoming a surburb of London, clung steadfastly onto its proper name of Hatcham. In its time the New Cross Turnpike Trust was famous. It was one of the most profitable and best organised turnpikes and grew to be responsible for almost 40 miles of main roads stretching from Bermondsey to Croydon. Notwithstanding that, when the toll gates were abolished in 1865 the area might well have reverted to being Hatcham if it had not been for the railways. England's railway boom of the 1830s led to two competing companies driving lines through the area. The first, the London, Brighton and South Coast Railway (LBSCR) established a station on the New Cross Road close to Hatcham in 1839. 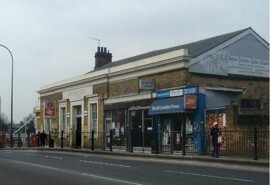 The second company, the South Eastern Railway (SER) established a second near Amersham Way in the heart of New Cross in 1849. Both companies called their stations "New Cross". The confusing state of affairs was allowed to continue until the two companies were absorbed into the Southern Railway on the post-war grouping in 1923. To avoid confusion the Southern changed the name of the "Brighton" station - the one furthest away from New Cross - to "New Cross Gate", leaving the "South Eastern" station as "New Cross". And so it has remained ever since. The building to the right of the turnpike still exists today, having been in its time stables, a cinema and now a garage. This change fixed the name of New Cross Gate into commuters' minds and so labelled the area to the west of New Cross and east of Peckham for ever. Telegraph Hill, Hatcham, New Cross, New Cross Gate - take your pick. Each has a history of its own and cabbies will continue to cope as they have done since the first hansom cab dropped the first resident off at his Victorian villa many, many years ago. New Cross Gate station today is little changed from when it was built although the site of the depot to the west which once accommodated 50 steam engines is now a supermarket.